John Daly is one of the most recognisable figures in PGA golfing, famous for his amazing ability to tee-off for great distances (this is how he got his nickname ‘long John’). His fame is also helped by the fact that there is a video game based on his character called ‘John Daly’s Prostroke Golf’; he has even dabbled in the world of rock ‘n’ roll as a backup singer. John Daly is an amazing guy who has seen plenty of success in his life – but he has also struggled and suffered due to addiction problems. John once caused a great deal of upset among his professional golfing peers by claiming that the majority of them used cocaine regularly. He went on to say that he was one of the few who did not engage in this habit, describing himself as a ‘clean living’ guy. The reality is that John has had some serious addiction problems; it has been a real struggle for him to commit to a sober life where he was not abusing something. For years, there was only gossip about John Daly’s alcohol problem, but he was adamant that he was fully in charge of his drinking. This claim became harder to maintain by 2008 when he was arrested for being drunk in public. There was a lot of negative publicity after this incident, and it was enough to convince him to quit alcohol. John does not regret this commitment to sober living because he has seen how much it has improved his life. 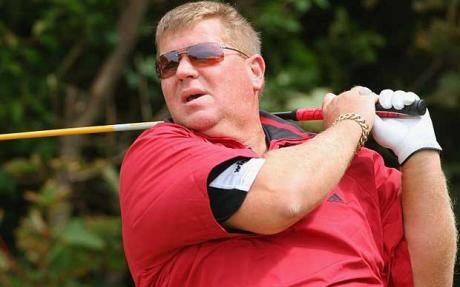 John Daly claims to have lost $60 million dollars on gambling over a 15-year period. In one incident alone, he lost $15 million. This is a colossal amount of money. He also admits to sometimes playing blackjack for as much as $15,000 per hand. This is one addiction that John still seems to be denying, not committing to changing this behaviour. The worry is that now he may gamble even more as a way to substitute for alcohol. John has struggled with weight problems for a long time as well, with things getting so bad that in 2009 he decided to undergo bariatric surgery. This involved placing a band at the top of his stomach in order to limit the amount he was able to eat. The surgery proved to be very successful and John managed to lose about 100 pounds in the months following the surgery. He is being encouraged to commit to a healthier approach to diet, which will require persistent effort; it is not like alcohol, where individuals can just give it up. Does John Daly Have an Addictive Personality? The fact that John Daly has struggled so much with addiction does seem to support the idea of an addictive personality. This is the theory whereby individual developing these problems tend to have characteristics that make them more susceptible – for example, impulsiveness, inability to manage stress, difficulty delaying gratification, prone to risk-taking, and low self-esteem (this can sometimes by masked by arrogance or extroversion). If an individual has this type of personality, they could just end up moving from one addiction to another until these characteristics are dealt with. It could also be the case that there is some type of underlying issue that is driving John Daly towards different types of addictive behaviour. In this situation, the person is more or less self-medicating their problems. Alcohol, drugs, gambling, and food can provide some relief from stress, anxiety, and depression but, ultimately, these substances make things much worse. It is good to hear that John Daly is taking such positive action to overcome some of his addictive behaviours. He is an amazing character, and the world of golf would not be the same without him.